Here are some Easter and Spring craft ideas that I’ve enjoyed making over the past few years. In Luke 10:38-42 we meet Mary and Martha. They are two grown up sisters living in Bethany. They are mentioned three times in the Life of Jesus. You can also read about them in John 11 – when their brother Lazarus is bought back to life – and in John 12 – when Mary anoints Jesus’ feet with expensive perfume. You could tell all three of these stories over three sessions or pick a couple. It’s good to include stories about women in our groups as so many of the listeners are women and a lot of Bible stories are about men! I always try to be mindful of this when I’m planning which stories to include. ‘Mary and Martha were two grown-up sisters. One day Martha invited Jesus to come to their home for a meal. 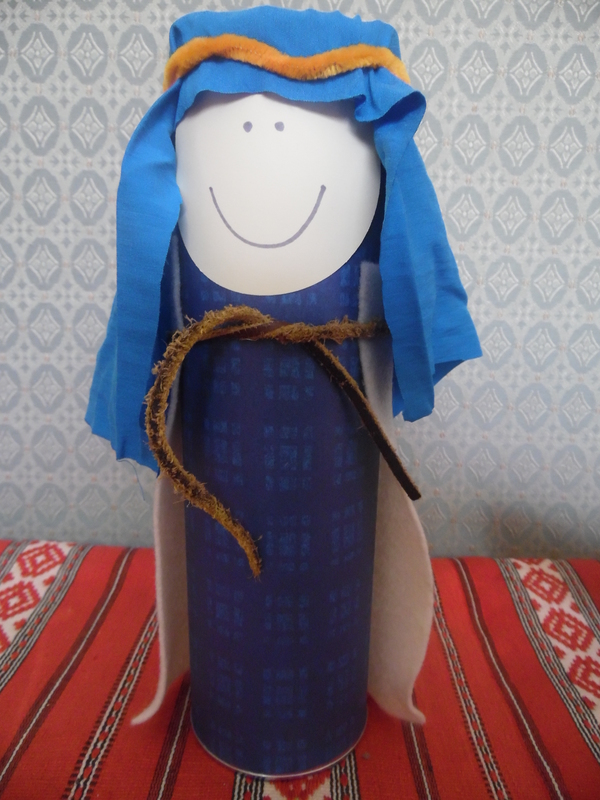 Jesus was very happy to go to Mary and Martha’s house. When he got there Jesus began to talk about God. Mary so wanted to listen to everything that he had to say. She sat down and listened. Mary sat still and listened to Jesus. I thought I’d put all the animal stories that we’ve done in one place! Here we have ravens, bees, big fish, lions, fox and sheep. Craft ideas and some story plans and ideas too. Of course you could add creation and Noah too. 2 And the word of the Lord came to him: 3 “Depart from here and turn eastward and hide yourself by the brook Cherith, which is east of the Jordan. 4 You shall drink from the brook, and I have commanded the ravens to feed you there.”5 So he went and did according to the word of the Lord. He went and lived by the brook Cherith that is east of the Jordan. 6 And the ravens brought him bread and meat in the morning, and bread and meat in the evening, and he drank from the brook. 7 And after a while the brook dried up, because there was no rain in the land. 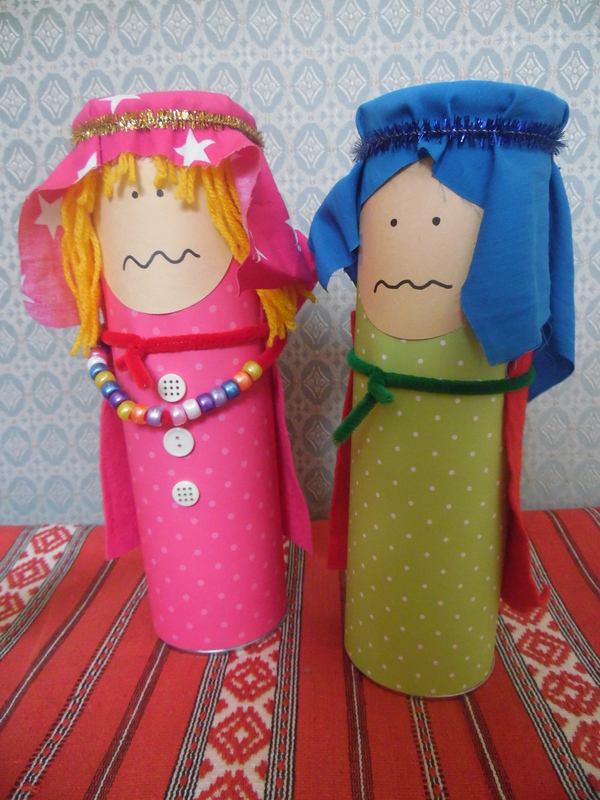 To put the story in context we had King Ahab and Queen Jezebel in the story bag and explained that they were a bad king and a bad queen who were horrible to people. Elijah was also in the story bag. At the beginning of the story these three people are introduced to the children. Elijah went to see King Ahab. He had a message for him from God. ‘King Ahab, God has said that there isn’t going to be any more rain for the next few years’. There was going to be no more water for King Ahab or Queen Jezebel. There was going to be no more water for Elijah. But God told Elijah what to do. Go and hide in the valley. I will send ravens to give you food. You can dink water from the stream. Elijah did what God said. He went to the valley where the stream was. When it was getting near to going to bed at night the ravens came with bread and meat for tea. God took care of Elijah. God is able to look after you too. 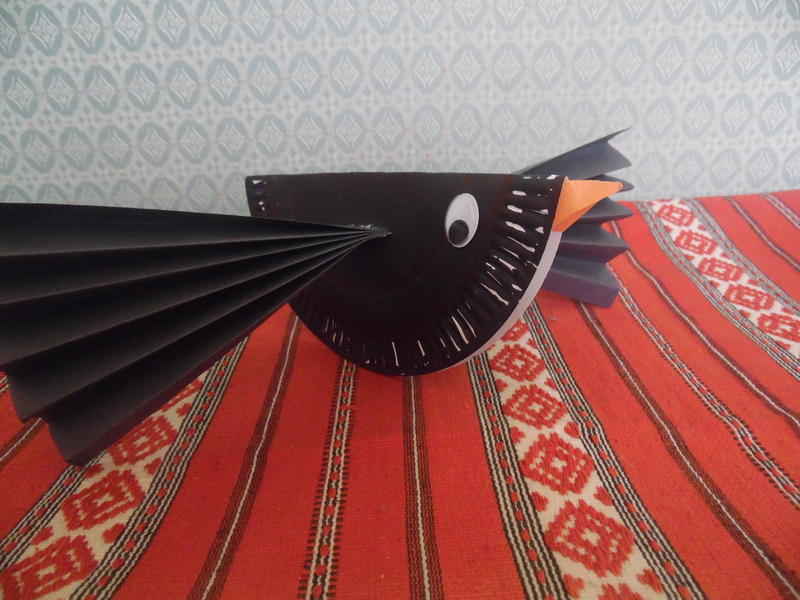 The ravens were made from paper plates. 7. God was going to help Samson use what he saw to rescue his people from trouble. At the end of the story I told the children that they could find this story in Tesco, Asda etc and showed them the Lyles Golden Syrup tin. The craft was a simple paper plate cut in half. 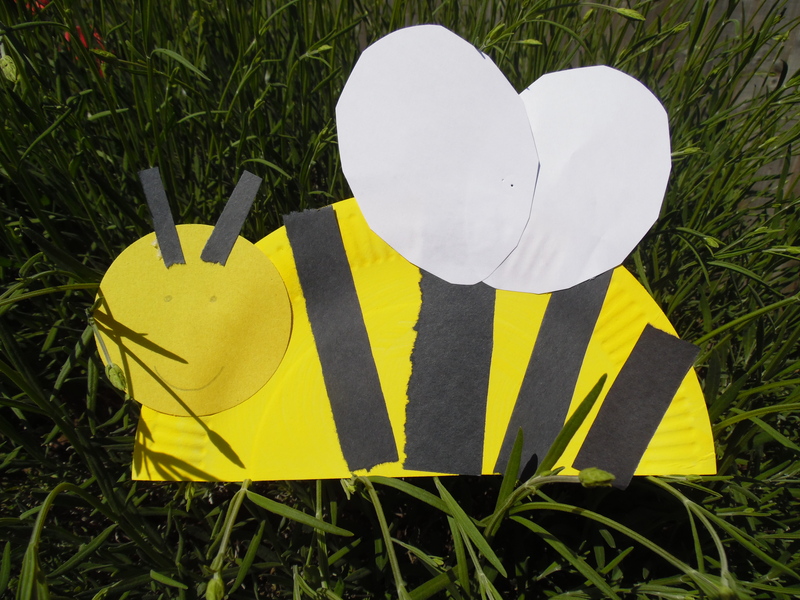 I painted them yellow at home and the children added the stripes, head and wings. I found the idea on Pinterest – it’s from Happy Home Fairy. 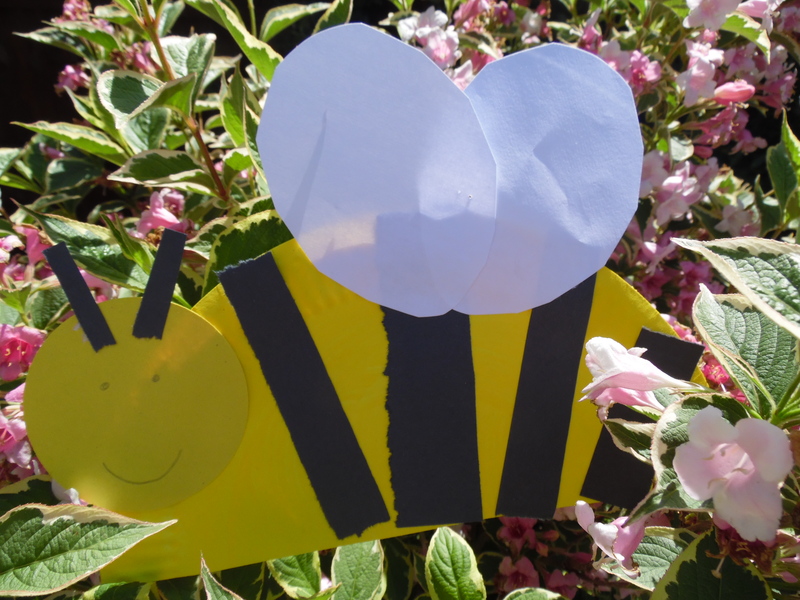 My bee is slightly different – I tend to steer clear of googly eyes as they are quite easy for an under three to choke on. I didn’t bother with feet either as i like to keep crafts as simple as possible. 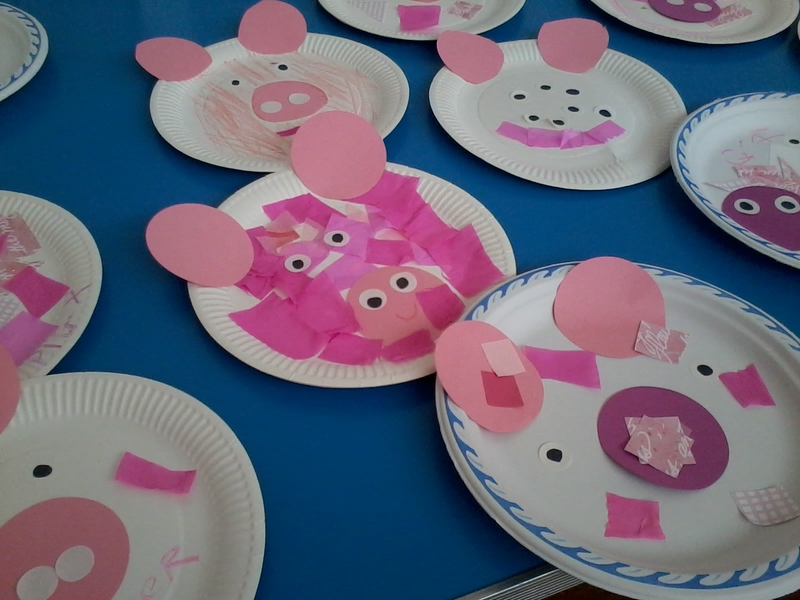 To tell the story – use some props including money, party streamers/hats, pretend pigs, new robe/coat/ring/shoes. ‘There was a man who had two sons (count to two). The younger son wanted his father’s money. So the father decided to share all his things between his two sons. Now they had a lot of money. (jingle the money). A few days later the younger son got his money and packed his bag and went far away. He loved spending is money! he had lots and lots of parties (show party streamers/hats). One day he looked in his pocket for more money but it had all gone! He had spent every last penny! He was in trouble. He needed a job. He went to work looking after pigs. What noise do pigs make? oink,oink! He was so hungry that he could have eaten the food that the pigs ate. No one helped him. He was sad. So he walked and walked and walked till he could see his old home far away in the distance. Someone saw him coming. Someone had been looking and hoping that he would come back home. It was his father. His father was so pleased to see his son that he ran down the road to meet him and hugged him. The father gave his son new clothes to wear, new shoes and a ring. (show these items) He was so happy that he had a party. When we come back to God it is like we were lost but are now found. 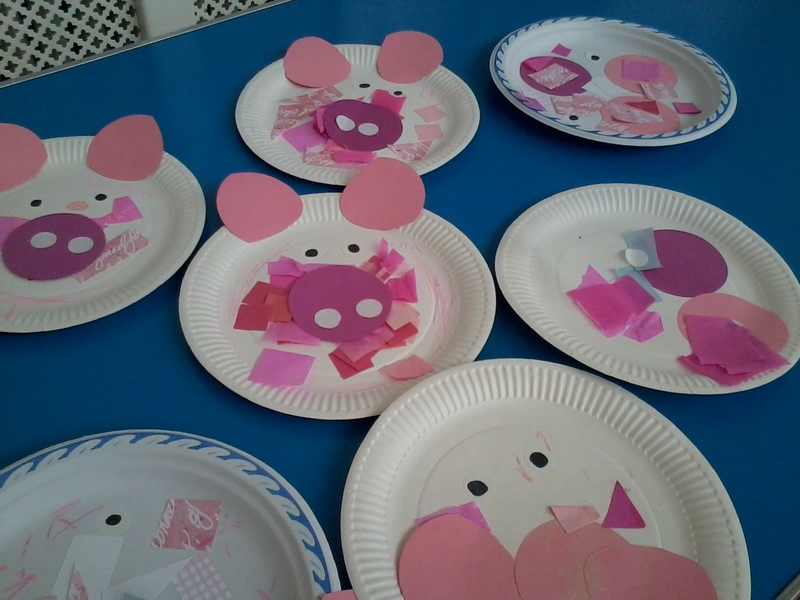 Craft Idea – paper plate pink pigs. We allow plenty of self expression! Nehemiah was given the job of rebuilding the wall of Jerusalem. His enemies made fun of him, ‘if a fox climbs on your wall it will fall down!’ (Nehemiah 4:3) they said. But Nehemiah kept building and with God’s help the wall was finished! 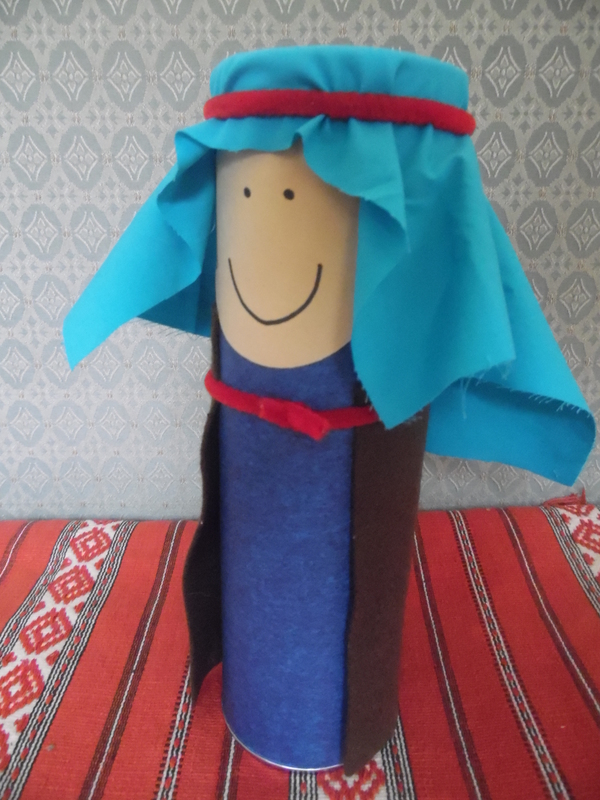 In the story bag – wooden bricks for the wall (not in the photo – I used our toddler group bricks), two men – Nehemiah and Sanballat and a fox. Daniel in the Lion’s Den from Daniel 6. In the story basket there were Daniel, the King, an angel and some lions. Say hello to Jonah! Jonah was given a job to do. God told him to go and tell the people living in Ninevah that God loved them. So Jonah packed his bag and went the other way. He walked to the boat (make walking sounds by tapping hands on knees) and he bought a ticket and off he went. Do you think God knew where Jonah was? God knows everything. He knew that Jonah was on the boat. But the storm got worse and in the end they had to throw Jonah into the sea. Splash! Jonah knew he had done the wrong thing and he talked to God. ‘I am sorry’ he said. Could God hear Jonah? Yes, God hears when we say sorry to him. God said, ’Jonah go and tell the people of Ninevah that I love them.’ This time Jonah did what God said. Luke 15:1-7. Jesus told the parable of the lost sheep. Very young children will probably benefit from using smaller numbers – maybe just up to ten with the number ten sheep missing. Before you begin hide a sheep but unless you have a small group give the task of looking for it to a helper (who knows where to look!). You could dress as a shepherd or take have a picture of a shepherd to show (we had a shepherd’s crook to show too). Ask the children what sort of animal a shepherd looks after and if they don’t know after one or two tries tell them – a shepherd looks after sheep. Ask them to make the sound a sheep makes. Explain that Jesus told a story about a shepherd who had 10 (100) sheep. He looked after them. At the end of the day he counted them. Have some sheep to count and count them altogether 1,2,,3,4,5,6,7,8,9…..Oh no one is missing! Where can he be? At this point pretend to look for the sheep and find him. Explain that Jesus told the story to tell everyone that he has come to look for people – to help them to know and love God. 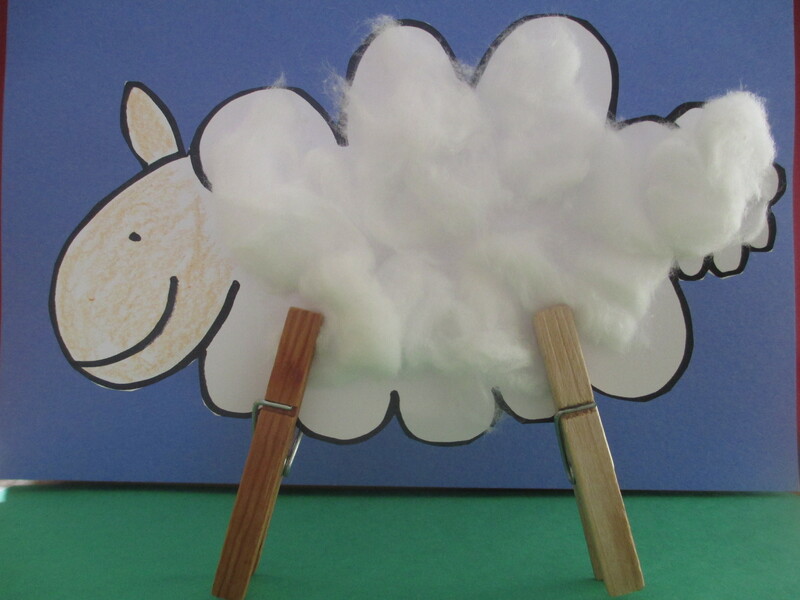 Pegs for legs sheep – print on to card and cut out for young children. They can decorate their sheep. make sure an adult adds the legs. 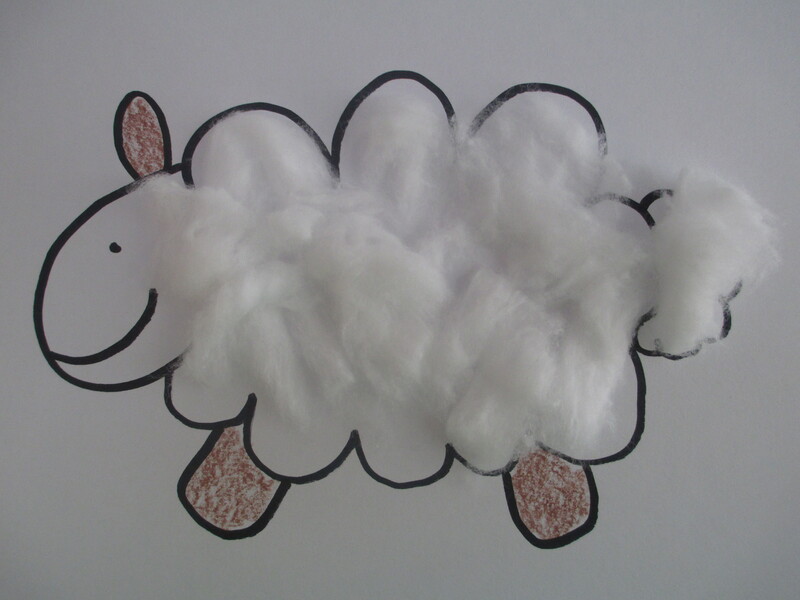 Sheep collage – print on to paper and decorate with cotton wool and wax crayons. The story is from Luke 5:17-26. In the story bag we had a man and his mat. And the crowds of people in the house. 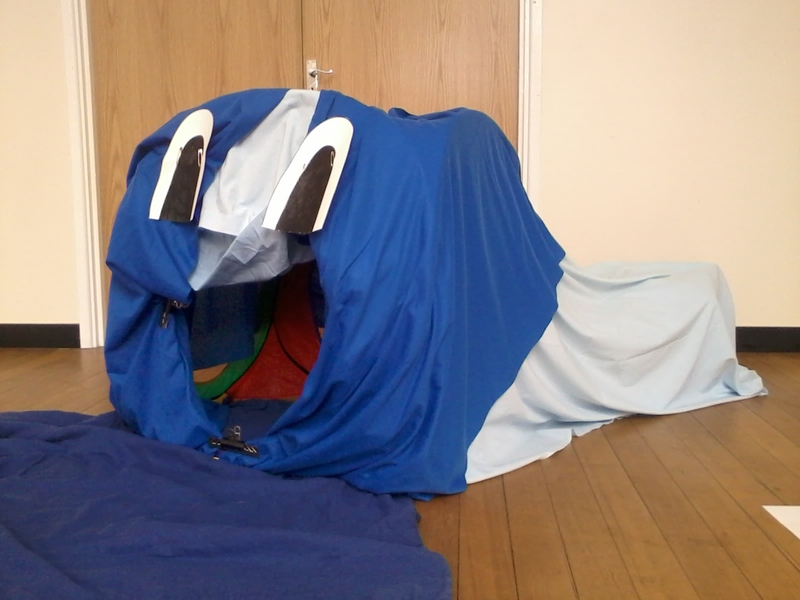 During the story we did actions – climbing the steps, digging through the roof. At the end of the story the man rolls up his mat and walks! Our craft was something I’ve done in another group before.